What Happens in These Private Events? How to pour an ounce. At Fine Art Bartending, for more than 35 years we have been teaching bartenders in Vancouver. We know how to both teach beginners in how to become great bartenders, as well as entertain groups with quick 2-3 hour class. If your group of 8 to 16 people is interested in ‘playing bartender’ for a couple hours then we have the space for you! When Can We Have Our Event? Friday is our only class-free day. This means whatever 2 hour timeslot works for you will also work for us. 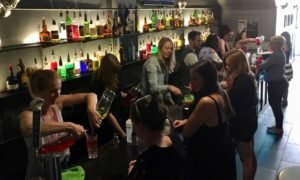 Again, round up your coworkers and confirm how many might be interested in doing something like a fun bartending class as an activity. We typically have our regular Weekend classes from 12-4PM. If you want to get the party started with a couple hours starting at 5PM… we can make that happen. Where is Fine Art Bartending? The bartending school is downtown on Pender Street between Richards and Homer. Located at 432 W Pender, we are just a few minutes walking distance from Waterfront Station. This puts us really close to restaurants, pubs and clubs for the next stop in your afternoon or evening of fun. Come by and check out the space. We are around from noon to 4PM most days. Pop your head in and have a look, or just check us out on Instagram. Give us a call at 604-873-2811 or send us a note at [email protected] for your private event. We can put together a custom price for your group that matches what you are looking for from the experience.